We had a great holiday. We spent about 9 days away from home and it was alot of fun. We stayed in Asheville twice, and at both the grandparent's house. Everything was pretty relaxing and very much fun. Andy and I even squeezed in an overnight stay in Abingdon, VA on our own - which was fantastic! We saw a Barter play and stayed at the Martha Washington Inn... a great getaway. As usual for our families, everyone was extraordinarily generous and Anne Marie came home with enough toys (in one trip thanks to borrowing the Dudney van!) to merit me cleaning out her playroom as it was and boxing up almost all her old toys. II think I'm going to keep up this toy "exchange" every few months so that the old toys will be new again! - Her hair is long enough that she needs a bow (yea!!) and thankfully she seems to have grown out of wanting to take it out. - You can ask her what a lion or tiger says (or if she sees a picture of one) and she'll make this adorable low-throat growl. Often it makes her cough then, which is also cute. -She starting to sign "please" (which she likes because Mommy and Daddy go nuts when she does it) and "eat". Hopefully I'll have the discipline to keep this up. I think it helps with her frustration when she can communicate. -She's really interested in airplanes now and we visited the Dekalb Peachtree Airport. There's a neat playground and you get to be right next to the runways so you can see the take-offs and landings. Alot of fun for the whole family. -She got a "Fridge Phonics" toy for Christmas where you can put magnetic letters into the magnetic main piece. The main piece will either sing a song about the letter or, if you press another button, will sing the ABC's. 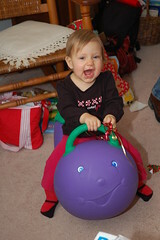 Anne Marie adores this toy and if you ask her to play her song, she'll go press the ABC button and sing along! It's so cute... sounds like "Hay, Huh, Huh, Hay..." in rhythm with the ABC song. If you just ask her to sing a song (away from the toy), she'll sing the same thing. -She's showing more affection to us and to baby dolls and stuffed animals. She likes to give hugs, kisses (big, open-mouth messy affairs), and feed the baby (after she's had some) from the fake plastic bottle. -Not that this is too new, but it's certainly still growing - she's got a temper! She can get frustrated and will show her anger by throwing a tantrum on the floor or trying to hit or kick. I've taken her at least twice into her playroom (on the soft floor) and left her to finish her crying. - She understands several words and adds more everyday. You can no longer say "out" "outside" "walk" without her running to the carport door and asking to go out. Also, "eat" and "hungry" will make her run to her highchair. But I can also say "Put your paci in your bed" and she'll do it! -She's just learned to operate our lever-handled interior doors... This means a new level of childproofing is probably necessary. Well this is just a few of the reasons she's been keeping us busy and delighting us with the little person she's becoming. What a grown up little girl we have now! Hope everyone is well and that we'll see you soon!